Radon mitigation in Port Washington WI is an ultra important home repair project to have done if you are conscious about your health. Radon gas causes the second most lung cancer cases in the US with smoking being number one. There’s a good chance that if you are reading this that you have already have had your home tested for radon and the levels were above 4.0 pCi/L, if this is the case, there’s no need to worry! We have doing radon mitigation in Port Washington and all of Wisconsin for 21 years, and our goal is to provide the best service, price, and warranties in the country. Radon mitigation can be performed in any household, in fact we have never run into a home that couldn’t be fixed. If you haven’t had your home tested, we also offer radon testing in Port Washington. Radon testing is the crucial first step in the mitigation process, and can be done for as little as $25. If you would like an estimate for radon mitigation or want to set up a proper radon test at your home in Port Washington give us a call now! All of our estimates are free of charge, and you have the option to receive your estimate by phone, through email, or in-person! As mentioned earlier, radon testing in Port Washington can be done for as little as $25, but there are multiple options to choose from depending on your needs. The $25 option is a charcoal testing kit that we can send to you, postage and lab fees are included in that price and that test can be completed in 3-7 days with results from the lab back in a week after that. This is a good option for homeowners that are not in the process of selling, and who have never completed a test before. This test is good for a first average. Another testing option we offer is the Corentium Pro digital test. Digital testing is perfect for homeowners who are in the process of a sale, and who need results quickly , but this option is also popular with homeowners who want a more detailed report, or who want a company like us to do all the leg work. We offer digital radon testing in Port Washington for $110 and that includes drop off and pick up and the full report of your radon levels hour by hour for 48 hours. If you are looking into long term radon testing because you have done a few tests that are borderline, we offer a long term canister test that can be set up for a full year. We offer drop off and pick up of the long term canisters, and the lab fees and shipping are all included for $180. If you are interested in having any of these radon testing options done at your Port Washington home, give us a call! Radon mitigation systems in Port Washington generally fall into the price range of $800-$1500. The pricing is largely dependent on the home and what is needed to lower the radon levels to a safe range for years to come. Beware of one price fits all quotes that you may receive from other companies. Radon systems are not a one size fits all type of project, and if your aren’t being asked any questions about your home before getting a price, you can almost guarantee that there will be hidden charges on the day of install. The biggest price factors are whether the home has a sump crock with drain tile or not, what type of sump pump is currently in the home (submersible or pedestal), whether or not existing electrical outlets are available where the system will be placed, and if there is a gravel or dirt crawl space open to the basement. Obviously there are other factors to determine the perfect system for your home, but the ones listed are the biggest. To get an accurate estimate for your home, give us a call now! Our knowledgeable and friendly office staff is here to help every day of the week! How long does it take to install a radon mitigation system? 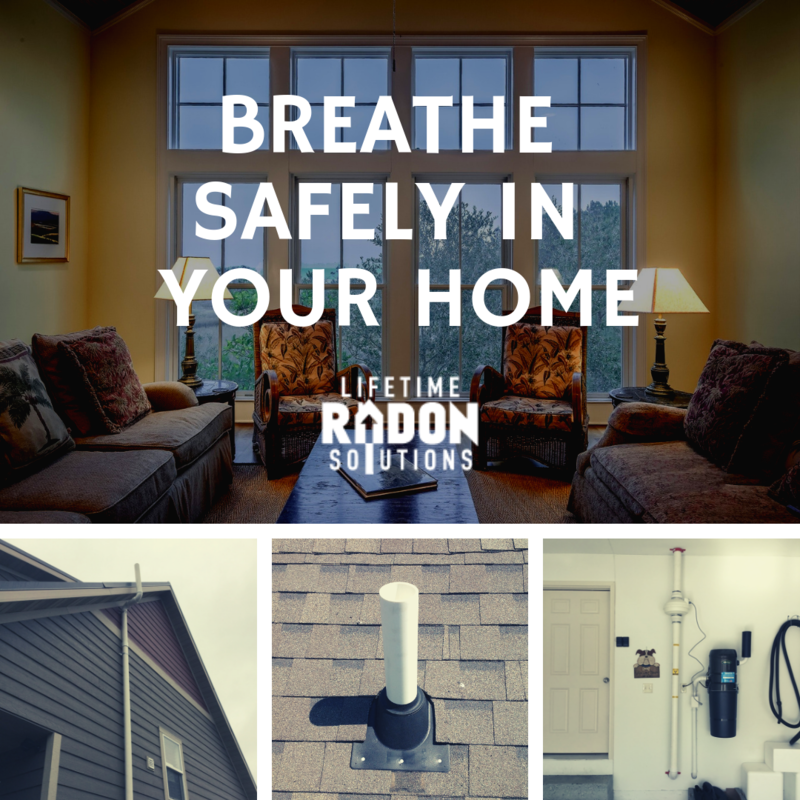 Radon mitigation systems typically takes 2-4 hours to install in a home. For homes that have large crawl spaces that need to be sealed, the process can take up to a full day. Standard exterior style systems tend to take 2-3 hours, while garage systems take a little bit longer due to the the amount of labor. Once finished, you can get retesting results in less than a week if needed. Does the radon system have to run out of my sump crock? No. Radon mitigation systems can be run out of the basement in multiple ways. The sump crock is just one way to start the system. If the home does in fact have a sump with drain tile, we can either start the piping out of the crock, or we can core into the floor pretty much anywhere in the unfinished portion of the basement 9 ½ inches from the wall and connect the pipe directly to the drain tile. If the home doesn't have a sump crock, the pipe can start anywhere in the basement where we feel we could get the best draw from with the application of a suction pit. What should my radon levels be? Technically there is no “safe” level of radon, but since it is everywhere, there do exister safer levels that you can be comfortable with in your home. The EPA’s action level is 4.0 pCi/L so anything under that is deemed sufficient. The most ideal results fall into the 0.2pCi/L to 2.6pCi/L range. Does the radon mitigation system require a lot of maintenance? The amount of maintenance needed to keep the system running properly is minimal. The homeowner should periodically check the levels on the manometer (u-tube) in the basement to verify that the fan is still pulling airflow through the piping, and retesting is recommended every two years. What’s the first step in fixing my radon issue? The first step in the process if you know your home has elevated radon levels is to contact a radon mitigation company such as Lifetime Radon. Once contacted, we can give you additional information regarding your levels, provide recommendations, and send you a free estimate. If your home has a radon problem, don’t hesitate! There’s no charge for getting information, and we will not hassle you to buy with us.